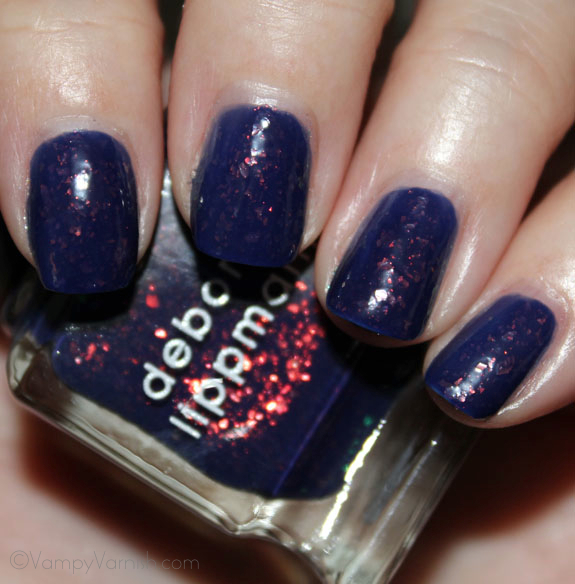 Remember when I showed you Deborah Lippmann 3D Holographic Nail Lacquer in Sweet Dreams? Well here is her darker sister, Ray Of Light. The formula with this baby is thick. SUPER thick. Not that easy to work with and much thicker than my experience with Sweet Dreams. 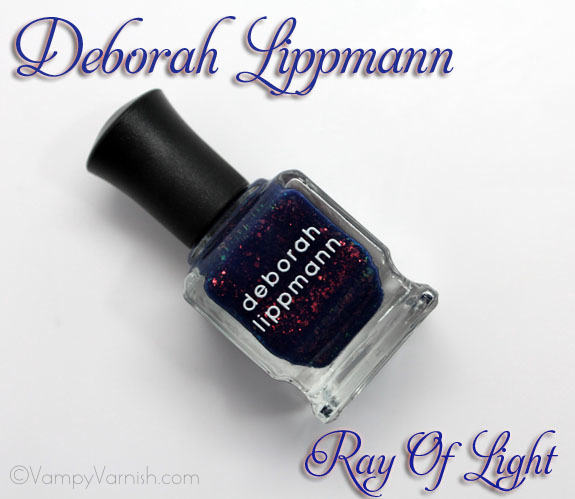 Ray Of Light is a dark navy blue, has a jelly-like base and it’s jam packed with multichrome flake glitter. 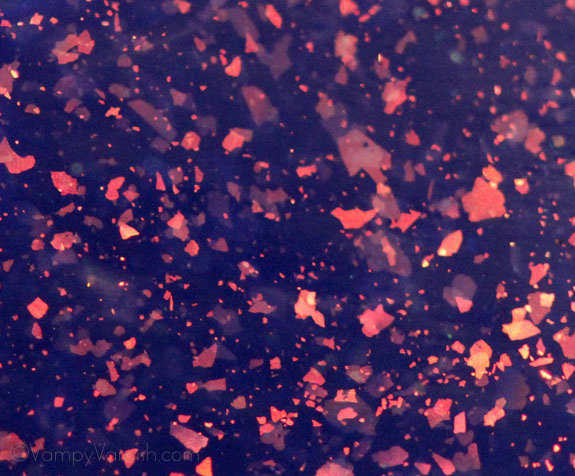 The glitter looks mostly red/orange but changes to greenish/yellow depending on the light. I felt like the flake glitter kind of sunk to the bottom of this polish though. That made for a kind of chunky, murky look, and not as amazing as Sweet Dreams in my eyes. What do you think about Ray Of Light compared to Sweet Dreams? Another Urban Decay Smoked Palette Look! Oh no, too bad the flakes don’t show well! I’d love it SO much more if the flakes are very much “in-your-face!” Sweet Dreams is much more awesome. Sunny @ Mostly Sunny´s last post…When You’re Running out of Time, Dior Hydra Life BB Cream Could Save Your Life! It looks pretty but for $18 and a thick formula I’d rather do a jelly sandwich and get similar results. This isnt a holo flakie, which makes me feel like ‘holo’ is this magic word to get people to buy things at this point. Deb should know better than to market it like that. It’s a duochrome flakie. And there are better ones out there, so Im going to stay away from this one at this point. I guess they can’t all be winners. It looks darn cool in the bottle though! I agree, I thought the same when I saw the last one as well. I’m not sure what she was trying to get across with the names. I might actually pass on this one! It looks so pretty in the bottle though. Le sigh. Oh well, saves me $ right? Thanks for the swatches! hmmm I like more how it looks in the bottle but is really pretty! I’m with Kat, with Essie Shine of the times you can make a look just like we hoped Ray if Light or Sweet Dreams would be and infact in any colour you have! I was excited when I saw your picture of the bottle but when its applied it is really boring! I think I will pass! Looks amazing in the bottle! It looks pretty but it doesn’t sound easy enough to use. 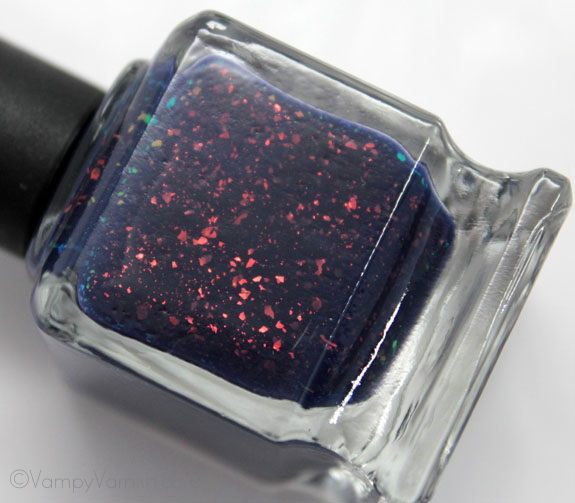 It looks great in the bottle, and that macro is gorgeous, but it’s really boring on the nail. That, plus the formula and the price tag, equals a pass for me. I might get Sweet Dreams, though! Thanks for swatching! 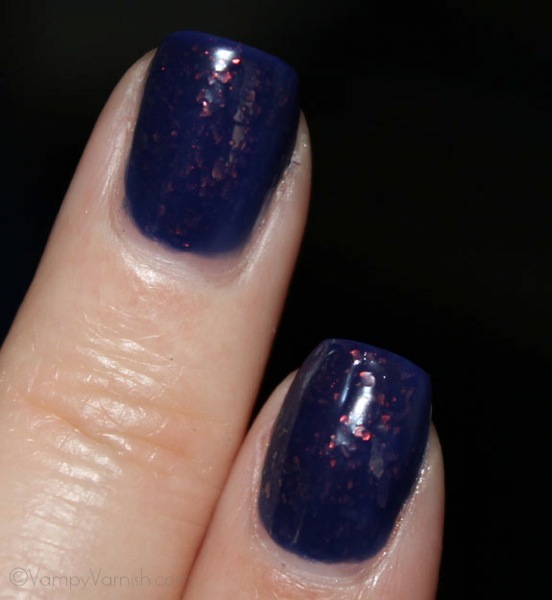 Hmm, maybe I’d buy this one if they hadn’t called it a holo when it’s obviously not or if the flakies actually showed up better on the nail or if the formula was better. So pretty much this one is a failure. I love how this looks on the bottle and the macro shot. Bummer that it doesn’t deliver. Ugh kill me now. Gorgeous. Looks like you could pour some Hidden Treasure/Shine of the Times/etc into some blue jelly for the same look or–even better–wear it over the blue.